Ultra Fast Application Performance. The NVIDIA Quadro 5000 by PNY graphics board significantly raises the bar for high performance visualization and computation providing Microsoft DirectX 11.0 and Shader Model 5.0 hardware acceleration, 2-way SLI support and the ability to drive a variety of display types including: CRTs, Digital Flat Panels, Projectors and HDTVs. Offering 2.5 GB of GDDR5 graphics memory, 352 NVIDIA CUDA parallel processing cores and built on the innovative Fermi architecture, the NVIDIA Quadro 5000 by PNY is a true technological breakthrough delivering ultra fast performance across a broad range of design, animation and video applications. 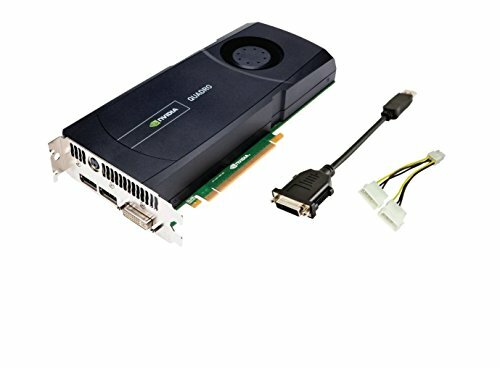 Memory Interface: 320-bit; Memory Bandwidth: 120 GB/s; Display Connectors: DVI-DL + DP + DP + Stereo.